A polarized panoramic view of Barcelona city from behind the protective cover of the new cable cars or teleferic cabins in Montjuic mountain, Barcelona. As you know this service has been available for years but old semi covered scary cabins have been replaced by the ones in the image. Now we have a whole brand new non-stop chain of cable cars conditioned for all kinds of weather, with all guarantees of security and more freedom of movement with a little less visibility. It's a pity that pictures aren't as perfect as could be considering the fair skies and the altitude but I think the polarized methacrylate cover is just a minor annoyance for photographers or tourists. The city in all its splendor lies at our feet and we suddenly seem to be flying as in some sort of amusement park attraction or soaring with a delta wing, hmm...more or less. Price is higher now so that keeps us locals away for the moment. I think the ride is worth trying though, at least once. 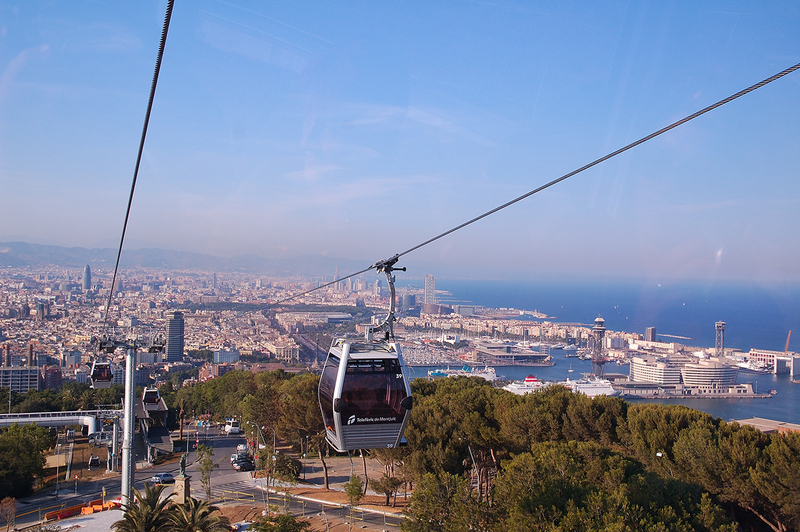 Check Montjuic cable car fares here. A panoramic picture of cable cars in Montjuic before renewal. A second opinion here. The place on a map. And finally a Google Earth satellite view of Montjuic Castle with cable car route and Barcelona port. Your photograph is nice and allows me to see your city spread out along the water. Interesting reading about your thoughts on the cable cars. My wife, Patty, and I have been married for 52 years today. Imagine that. Beautiful photo. Cable cars always scare me to ride.